For online casinos, the choice of software providers is quite extensive. Often times many great games are overshadowed by the big names. Regardless, rising software provider Leander Games has managed to steal the spotlight and have broken into the industry with an array of both traditional and unique pokies. We take a look at Leander Games, what they have to offer, why they’re worth your time and where we can find their gaming catalogue. One of the most intriguing, and well advertised, feature about Leanader Games is that the team behind the software provider is made up of employees from diverse employment backgrounds. These include writers, mathematicians, software developers, animators, and more, which is incredibly important with the ever-changing online casino market as it is constantly advancing in terms of graphics and features. Established in 2008 in Buenos Aires, Argentina, Leander Games started off by supplying games to Microgaming, however it eventually grew and in 2012 they opened their own supplier company. The team at Leander combined their expertise and created, and continue to create, a catalogue of uniquely themed games with clever features. 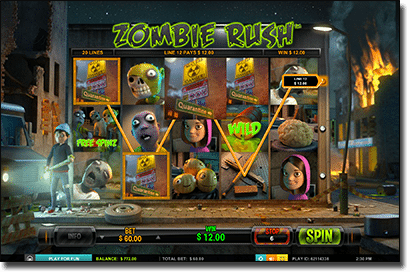 These games include standard video pokies and unique hybrid games. Interestingly, Leander means lion-man which explains their lion-head logo. They’re licensed by the advanced gaming jurisdiction, Alderney Gambling Control Commission (AGCC) and regulated by the UK Gambling Commission. This means their games have met the criteria of being fair and are regularly reviewed so that they remain this way. We aren’t the only ones to notice Leander’s rising success, with the company receiving multiple awards over the past few years. In 2013 they won the ‘Social Platform of the Year’ from EGR, while they won the ‘Platform of the Year’ in 2014 from EGR. In 2015 they took out the ‘One to Watch’ award at the Gaming Intelligence Awards. 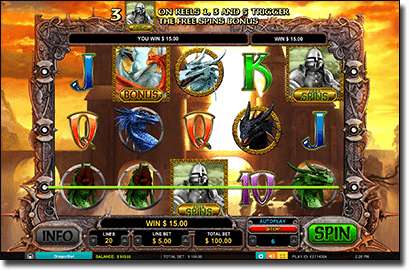 Leander Games are pokies specific, but they create hybrid games featuring traditional casino table games in a slot machine format. These have been titled as the Reely series, one of which we review below. Additionally, their catalogue is also made up of high quality video slots which have all the appealing features including free spins, bonus rounds, regular payouts and more. Through the use of a side bet players get to experience the best of both worlds. For those who are after the traditional pokies, there are quite a few available from the up and coming software provider. On top of being a unique pokies provider to online operators, Leander signed a deal with Full Tilt and PokerStars, both part of the Rational Group, to offer their pokies for the two poker sites to use. We’ve picked a two of the games from the above, one from each category, to share our thoughts on what the games have to offer. Combining two of the most popular casino games into a 5 reel 30 payline slot machine with a side bet for poker can be either a hit or a miss with players. We think Leander Games have a hit, however. The reels are lined with playing cards with the same card values as poker -the lower values on the cards are the lower symbols on the reels. The face cards, on the other hand, are the most important and include the Joker as the Wild and the Ace as the Scatter symbol. 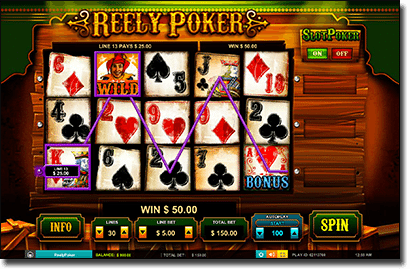 While you may think that this is all they have done to create a hybrid slot machine, they’ve actually made a side bet feature which appears on all of the Reely slot series. To make the side bet you will need to manually switch by clicking the option in the top right, and this will cost you 10 times the bet you’ve made on a payline. You can then pick a row out of A, B, and C which you believe will have the best poker hand. If you pick the right one you win. But that isn’t all, spin three Ace symbols in the base game and you will be taken to a poker table for the main feature. Here you will receive five cards and if you land a poker hand you win, but if you manage to get a royal flush you get 500x the bet. Overall this is a unique game worth trying if you are a fan of both the pokies and poker, while the graphics are on par with some of the top leading software providers we are accustomed to. Another important characteristic of Leander Games is that they also have a lot of pokies based on classic fairytales, including this one. 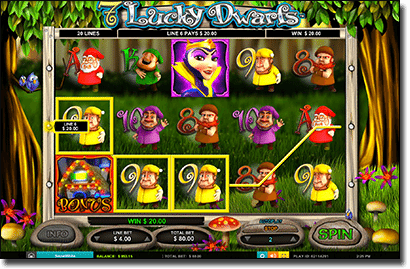 7 Lucky Dwarfs follows the classic tale of Snow White, her Seven Dwarfs and the evil Queen, but most importantly it has multiple bonus rounds which make this pokies worth a spin. Featuring 20 paylines over 5 reels we get to see all our favourite dwarfs including Dopey, Doc, Grumpy, Bashful, Happy, Sleepy and Sneezy. The Wild symbol is represented by Snow White, and the Bonus symbol is her house which appears on the first, third and fifth reels. Land three of these Bonus symbols and you will activate one of the two bonus games available, including free spins with multipliers, or the ‘Dig, Dig In Our Mine’ bonus where you can land prizes and multipliers. There are quite a lot of regular wins, though they aren’t big ones, but when you win so much it works out the same. This pokies is just one of that many top notch pokies from Leander Games. Overall Leander Games offers both innovative and unique titles which not even their competitors can offer, as well as high quality slots that are definitely worth checking out. For all the pokies and Reely slots by Leander Games, Slots Million is your best bet. To find all of the titles by Leander, simply follow our link to this reputable web casino, click to search via software developer and check ‘Leander’. Slots Million will then show you all the games they have by this software provider so you can try them out for yourself.